The Tale of An Unmarked Finger — Ananyo | कृति मेरे मन की……. 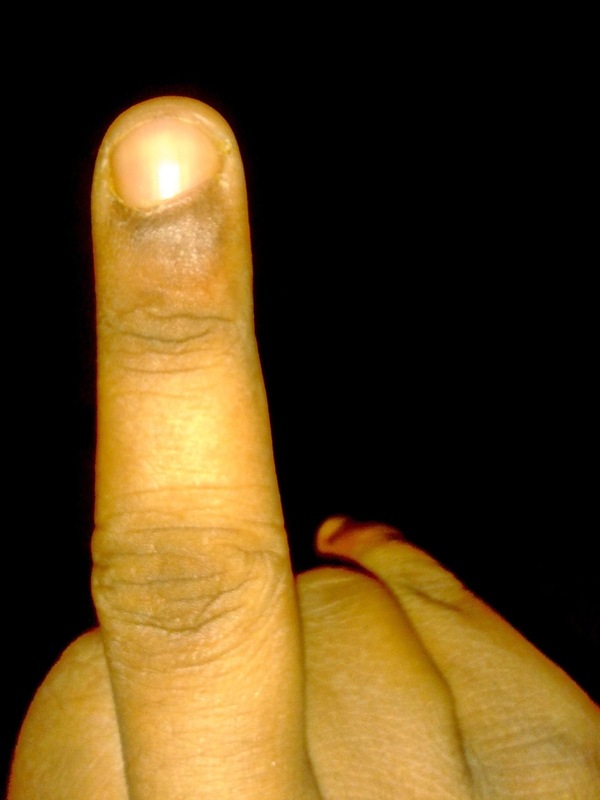 After seeing people proudly showing their fingers marked with voting ink, i thought why not then i also show my middle finger not marked with voting ink. But showing an unmarked finger rather than a marked one needs many things to be answered as our general consensus about voting is -“it’s our democratic rights, it’s my contribution, it’s my job towards my country etc etc ”. So there must be some reasons of why one’s finger remained intentionally unmarked amidst this fetishism of election. Am i not political? Am i not concerned about my country? I am asking the same questions to my friends who are proudly showing their marked fingers. Majority of them claim to be “apolitical”, ‘not interested in politics’ but at the time of election they are found to be very patriotic. It’s quite a riddle for me. So I thought why not i share my view on this event and let people decide who’s more concerned about his/her rights and country? and who’s logical…. As five years have gone passed since the 15th Loksabha was formed, the elections in the country are being conducted in a routine manner. This time the election process for forming 16th Loksabha is the longest in the parliamentary history of India. This is the first time the general elections are being conducted in nine phases too. These general elections are also experiencing largest deployment of polling personnel and security forces in a bid to conduct a ‘free and fair’ election. In the present 15th parliament, clashes between various parties on various issues broke the previous records. Although ostensibly they clashed repeatedly on a number of issues, a large number of bills were passed in a very least amount of time, without any discussion and without an opportunity for the people to ponder on them and with the collusion of the ruling and the opposition parties. How many of the voters with proud inked finger know about the bills which have been passed in the parliament? 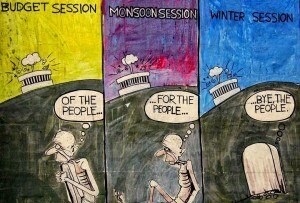 What bills have been passed and why? I would be very delighted to see some of them talking on these. Because these bills passed in the 15th Loksabha would have a long lasting grave effect on the society, economy and polity of our country. Its for sure that the coming 16th Loksabha would be formed by continuing the legacy of the previous Loksabha and unfortunately this ‘exercise of democracy’ would actually take place upto getting your fingers inked. Otherwise the policies being implemented before, since this process of election has begun would have been completely pro-people whereas we are seeing just the opposite. Election commission also only says “18 years old? It’s time to vote” but does it say anything about giving space to people’s aspiration in the policy making or in the implementation? How the planning would be done and who would be the beneficiaries? Even some multinational companies produce advertisements where a bollywood superstar would suggest you to lift your finger and make difference for a better India whereas the same companies also are found to be connected in illegal mining, various scams, forceful evictions, money laundering, exploiting the workers! Without going into page long statistics about what the condition of India really is and assuming you to be a very responsible citizen who knows about his/her own country (because you are showing your marked finger on the basis of the same notion-being a responsible citizen), my question is to my friends is – how your vote actually influence the policy making? Has it done anything alike? On the contrary, there is not a single policy which has been proposed from within the parliamentary system in the last 19 years of India polity; most of the policy proposals only came as a reaction to people’s relentless struggle for their rights and these emerged completely outside of the paradigm of parliamentary system. 65 years have passed since so-called independence, the overwhelming majority of the people are still poor in our country. None of the basic issues have been solved. None of the parliamentary parties have an independent path for the development of the country. All of these parties are saying that they would develop our country through neo-liberal policies, privatisation and by bringing in more FDI into our country (read-by evicting people from their livelihood in the name of development), some say a hindu state might do something good and they go on doing muslim pogrom. But where does your vote go my friend? Moreover,the huge amounts of election expenses of all major all-India and regional parties beg a query as to where they are getting such gigantic amounts of funds. How could every candidate for a parliament seat spend 10 crores of rupees and every candidate for an assembly seat spends 2 crores of rupees on an average? How many of these candidates are free of corruption and criminal records? How much is the role played by caste, religion, region, money and muscle power in candidates getting elected? Is there a single party that is beyond all these? Why are the ruling classes trying to satisfy the electorate with NOTA button without giving the people the right to recall? Why they are deploying state forces ranging from a few thousands to more than one lakh for every district and why are they not able to conduct elections without such huge deployments? Actually your vote is being used to delude you as well as others in a bid to curtain the real face of the society, where all the parliamentary political parties are actually the same, they serve the same cause- to mark your finger, take your vote, tight the mask and say democracy prevails and then serve the people whom they have been serving from the beginning and its not you and me my friend, thats for sure. On the contrary, your statement about contributing for the country through vote is actually doing just the opposite of that you are thinking- it’s destroying the nation. Whereas my unmarked fingers is a potent weapon, is a denial as well as a call and an oath to fight for real democracy, a call for building up people’s parliament; it’s an act of rebellion where my mind denies to get influenced by hundreds of crores of rupees spent by the rulers to refurbish the image of the rotten parliamentary system. And this weapon does frighten them because from Bollywood and Tollywood, cricket stars, industrialists, multinational corporations, media foundations, and non-governmental organisations (NGOs) are carrying out non-stop propaganda about the virtues of democracy, the sanctity of the vote, the necessity of NOTA, how not casting the vote was tantamount to aiding criminals win, and so on only in a bid to pacify people’s discontent. There was no end to web sites and blogs calling on people to exercise their franchise. To lend an air of credibility to their propaganda they asked the voters to use their wisdom to choose between the good and the bad, if there is none to be chosen then choose NOTA, reject the criminals and corrupt elements, and to elect the virtuous, as if there is a possibility of ‘virtuous people’ being left in the parliamentary pigsty! So, I’m proud and I’m exposing my unmarked finger as I’ve denied to be deceived, to be deluded because my unmarked fingers could not be used as the weapon to deceive others, those would not be helping the rulers to continue their oppression, their autocracy and to continue with the sham of democracy where you can only get your finger marked but can’t get democracy, can’t get your voice being heard and your dreams being fulfilled. I’m proud because in fact I do care more for my country.